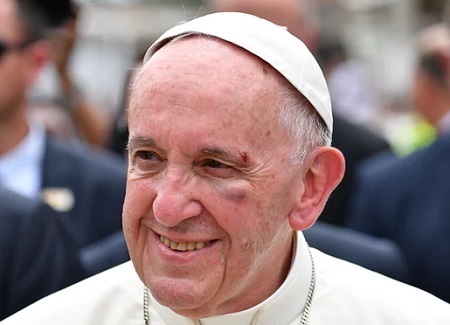 Pope Francis had his eye bandaged and blackened after an accident in the popemobile, wrapped up his trip to Colombia on Sunday appealing to the country to “untie the knots of violence” after a 50-year civil war. His last day in the country got off to a rocky start when he lost his balance and bumped his head while riding in the popemobile. He bruised his cheekbone and cut his left eyebrow, blood staining his white cassock. The Vatican said he received ice treatment and was fine. A smiling pope continued the trip wearing a bandage over his cut. “I was punched. I’m fine,” he joked afterward, the bruises on his face clearly visible. At the end of the day, when he said mass for hundreds of thousands of people in the city’s port area, the bruise had swollen and he had blackened skin under his eye.